Last week, British Prime Minister Theresa May survived a vote of no-confidence by a painfully lackluster score of 200 to 117. Worse, she promised not to lead the Tories into the next election, due no later than 2022. 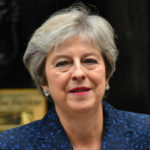 To now complete the fraught and consequential Brexit process by 1/21/19 as a lame-duck, lacking the confidence of 37% of her party, while leading a minority government is a recipe for disaster.